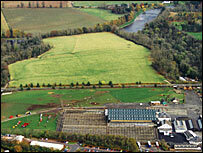 Plans for a £5m auction mart and rural centre in the Borders have been approved in principle by councillors. The proposed development by Newtown St Boswells auctioneers John Swan Ltd includes two auction rings, a visitor centre and a 250 capacity hall. The complex will be built across the A68 from the firm's current mart. Scottish Borders Council's planning committee also approved proposals to build about 200 new houses on the site to be vacated by the auctioneers. The new auction mart will have accommodation for up to 17,500 sheep or 2,750 cattle.